The coyotes usually keep them at bay. So this was quite a special day! Cheers to you from the newly arrived Holler quail! Those are beautiful shots. Rare visitors are the best:-) What do you shoot with Cindy? Beautiful bird. Funny though, that feather sticking out on one side of the head. Pretty hilarious…..I’ve seen fish with similar appendages. I think the intent is for prey to go after the lure rather than the critter! Lovely photos of my favorite little charmer ! Great shots, Cindy! I love quail. They are funny little birds, aren’t they? Blessings! Well, that’s a feather in your cap! Oh, wait, the quail took it! 😀 Fabulous shots, Cindy! He looks so regal and “Charles in Charge”! Such perfectly beautiful shots…I love quails, I remember one of the first books I read was “That Quail, Robert’ and then we had them around growing up. These are such crisp, beautiful shots. Everyone of these I thought “that is my favorite…” all of them so nice. Cute bird. I know some teenagers who have haircuts like that! Looks like it’s wearing a fancy hat! 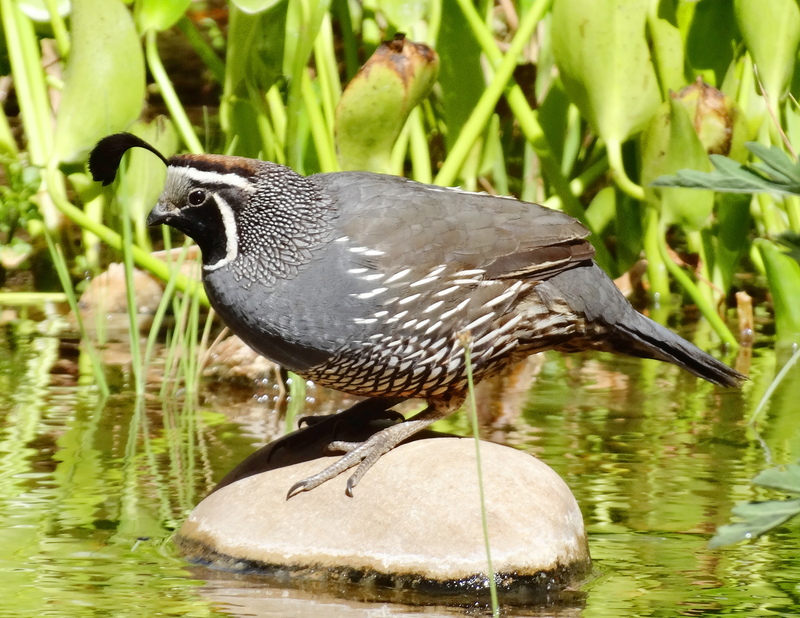 I loved the beautiful photo of the quail. The only other time I’d seen one is on my husband’s dinner plate. Ugh! Yes, I prefer them walking and head bopping around!!! Indeed,very special and rare visitors,dear Cindy ! You caught action and beauty at the same time; the plumage details are awesome !!! Love to you and our very special feathered friend !!! I can see why you’d be excited – these are lovely creatures! Great photos – thanks. Oh my! So glad the quail are safe and sound, so far! I wondered, Cindy, are they related to Bob-Whites? They look like what we call that but I am sure they are a little different. 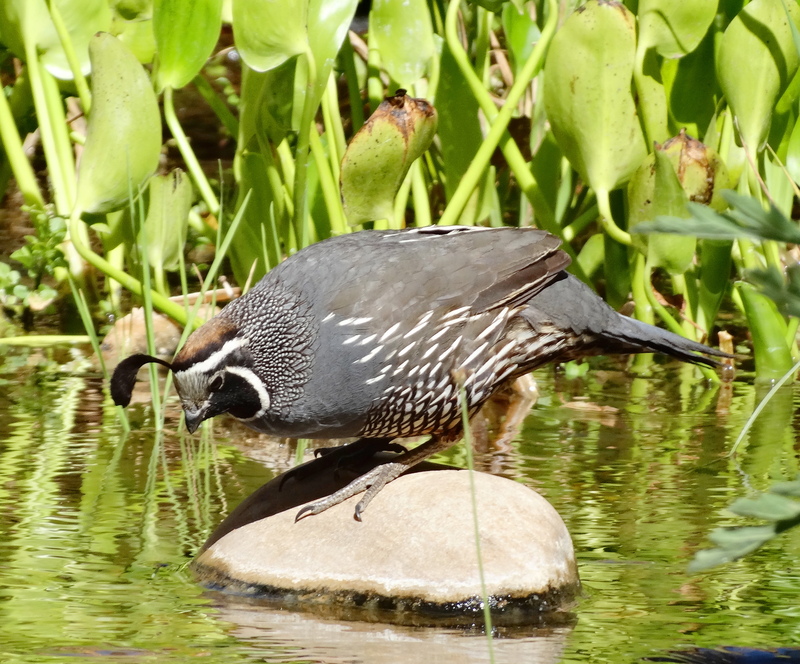 I am so glad you caught the one tipping its head down to look at the fish or below the water. It is such a cute pose! There are many sub-species of quail so they may well be related but I don’t know. So happy you enjoyed them Robin! Gotta love that flare of feather fashion sticking out from the top of its head! It is quite fashion forward! 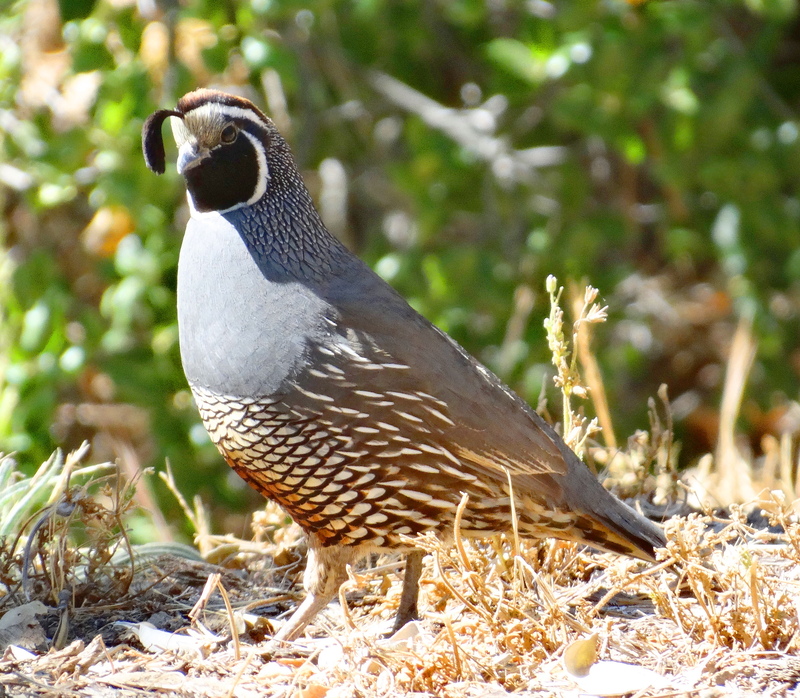 what a good looking quail! 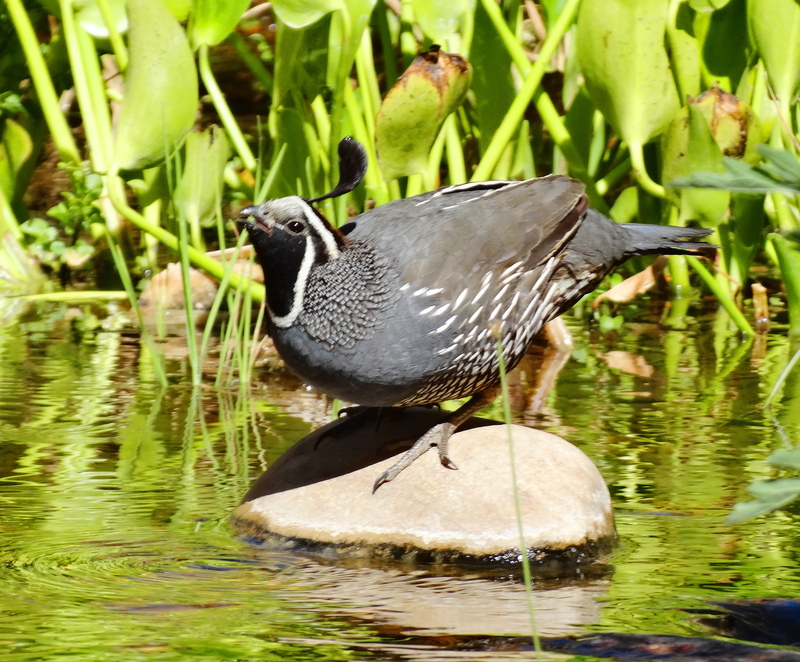 Cindy – Bob White Quail are my favorite of all. I grew up hearing them sing outside my bedroom window. Of course my brothers and father hunt on the ranch but they had to be at least 2 miles from the immediate home, barns, etc. because mother made pets of the Quail. This carried over to me and once we were settled into our home in NC, I had the perfect habitat for Bob White and received a permit to bring in two covey of quail. Of course no hunting was alive and I had Dad to guide me on exactly what they wanted to eat (he came out from Kansas when I first got them to go to the grainery to have their food milled properly). Then we added in some other items they normally flourished in and every time I went out to feed my birds (all kinds I could rejoice in my heart especially with the Bob White). I loved waking up to their calls to each other and Dad and I worked side by side to ensure they had perfect safe places to lay eggs, etc. The wildlife and game commission monitored my progress for the first six months and after that, I received routine calls from them about bringing in other compatible birds that were loosing out in NC since I was doing so much hand feeding. Between the extensive gardens I built and taking care of the birds, those were some of the happiest days of my life. Unfortunately, Tom was very ill there and the day came when we had to leave. I have ever so fond memories of those years. Your nature photography brings back so many fond memories for me. Thank you. My comments are long. Please feel free to edit them out of your comments. You won’t hurt my feelings. I know they are long but I had to say thank you for adding joy to my day, even now. What kind of person would edit out these fascinating comments???? Not me! No way! 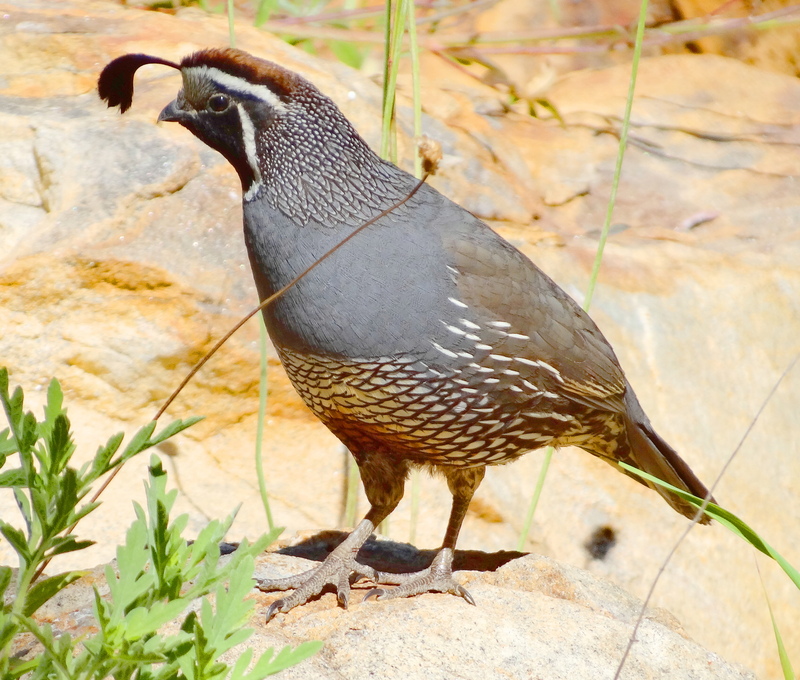 I had a friend who raised several different types of quail when I was a child in several outdoor aviaries so I am very familiar with the joys of raising quail and watching them grow. I bought a incubator and quail eggs as a child and tried to hatch them but they didn’t hatch, which was probably a good thing since I was in elementary school and could never have fed them round the clock. Your bird sanctuary sounds postively idylic and if you were still doing this I would want to visit and photograph. You are a remarkable person Sheri who I feel so grateful to have met here in the blogsphere! ‘Kay. Nice to “see” you. Your stuff IS the bar. Oh so thoughtful and so appreciated! I am honored and most appreciative! Another cutie, have a few pictures myself, such a neat bird! Great photography! 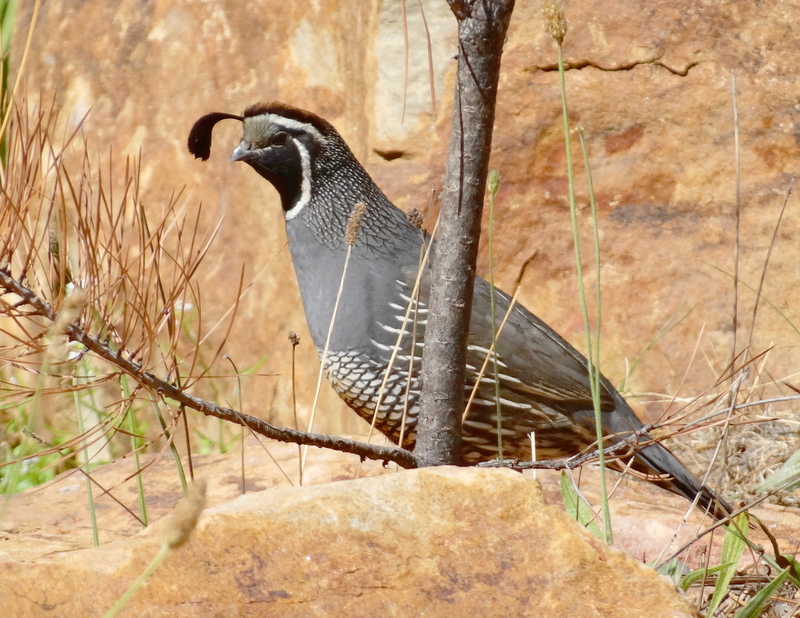 I just love it when we see quail in our little corner of the world. Sadly, it usually means that these lovely birds are fleeing from wild fires to the west of us. We’ll keep the welcome mat out for them all the same. Cheers!